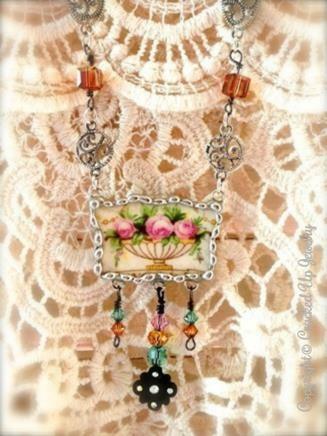 A lovely vintage style antique china necklace! Complete with wonderful filigree and crystal embellishments. 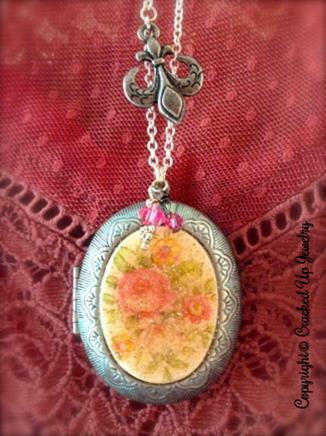 Beautiful floral antique china locket with fleur-de-lis embellishment. 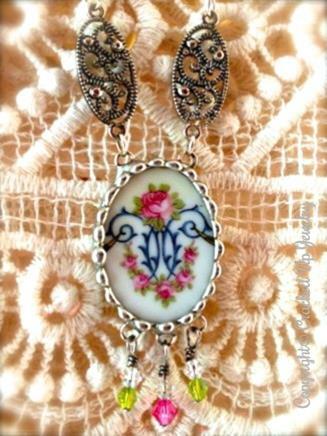 Stunning antique style, charming rose, broken china necklace. Broken China Jewelry is artfully created using recycled antique china! I enjoy transforming these broken yet still beautiful antiques into wonderful keepsakes to treasure. Each design is unique & one of a kind, with attention to every detail. I offer a selection of broken china jewelry necklaces, rings, earrings, pendants, bracelets, brooches & belt buckles. Whether you are looking for a unique one of a kind gift or to transform your broken china into a beautiful treasure, you are sure to find it here. Custom orders are a PLEASURE! Have your own meaningful china? I would be happy to turn your china pattern into a special keepsake that will be treasured for years to come. Recycle your broken shard, porcelain, china or fine bone china into a wonderful family heirloom. A new design for fall! Antique china patterns with a silver tone twist. Broken china earrings add beauty to any outfit. Designs include vintage styled, retro & boho. Earrings are sterling silver french wires. Wonderful sterling silver rings! 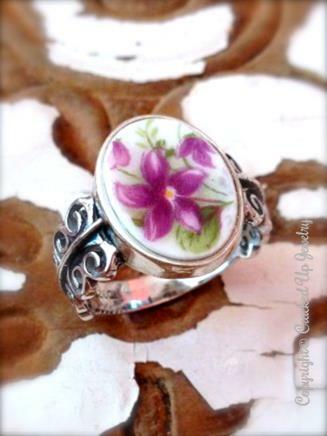 Antique china patterns set in wonderful sterling silver settings. Designs include petite & dainty rings to beautiful filigree settings...something for every style!